BERLIN, Germany (CNN) -- The German government plans to meet Wednesday night to discuss the future of carmaker Opel and weigh bids for the General Motors subsidiary. 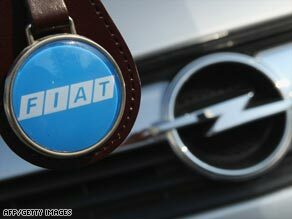 Italian carmaker Fiat is one of at least three parties interested in buying Opel. A spokesman for the German chancellor's office said he did not expect a final decision on Opel to be made Wednesday. "It's just to check the offers of the investors, then to see how we can go on," said the spokesman, who declined to be named. The German government is expected to discuss bridge financing that would keep Opel running while an investor is sought. Officials will also discuss which of the various bids they prefer. So far there are three prospective buyers for the carmaker: Canadian-Austrian supplier Magna, Italian car company Fiat, and U.S. investment firm Ripplewood, the German government said. Beijing Automotive Industry Holding has also expressed an interest, according to media reports. The government has said it wants to reach a decision on Opel before the U.S. government opens insolvency proceedings against General Motors. It has been holding talks with prospective Opel buyers, countries that sell Opel cars, General Motors and the U.S. government. German Chancellor Angela Merkel has said she has two priorities in the discussions about Opel -- to protect jobs and to spare German taxpayers.